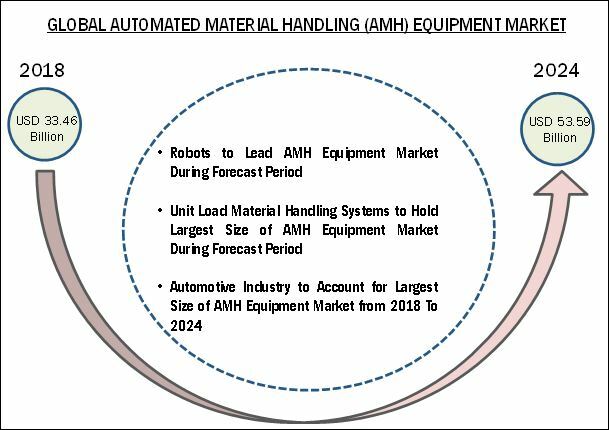 [184 Pages Report] The automated material handling (AMH) equipment market is estimated to be valued at USD 33.46 billion in 2018 and is expected to reach USD 53.59 billion by 2024, at a CAGR of 8.2% during 2018–2024. Growing presence of start-up companies offering robotic solutions for warehouse automation, increasing popularity of AMH equipment among leading industries, significant recovery in global manufacturing, and rising labor cost and safety concerns are the key factors driving the AMH equipment market growth. The base year considered for the study is 2017, and the forecast period considered is from 2018 to 2024. The report provides detailed information regarding the major factors influencing the growth of this market. After the successful implementation of mobiles robots by Amazon (US) in its warehouses for the pick-and-place operations, several companies have shifted their focus to implementing mobile robots in their logistics operations. Moreover, the evolution of the goods-to-person concept and robotics-enabled order fulfillment has further fueled the demand for mobile robots in warehousing operations. In the past few years, there has been a significant increase in the number of start-up companies in the mobile robotics ecosystem. Fetch Robotics (US), IAM Robotics (US), Magazino (Germany), 6 River Systems (US), GreyOrange (Singapore), Locus Robotics (US), Geek+ (China), and InVia Robotics (US) are a few of the fastest-growing start-up companies in this ecosystem. These players are offering cost-effective, flexible, and efficient mobile robots, which can be used for automating various warehouse operations, such as storage and retrieval, transportation, and packaging. Furthermore, the favorable environment created by venture capitalists for investments is encouraging the mobile robotics start-ups to develop new products. For instance, in April 2018, 6 River Systems (US) raised the Series B funding of USD 25 million with Menlo Ventures (US), which is a firm specializing in providing capital to the start-up companies. This research study involves the use of secondary sources such as encyclopedias, directories, and databases (OneSource and Factiva) to identify and collect information for an extensive technical and commercial study of the AMH equipment market. Primary sources such as experts from related industries and suppliers have been interviewed to obtain and verify critical information, as well as assess prospects. Key players in the AMH equipment market have been identified through secondary research, and their respective market rankings have been determined through primary and secondary research. This research includes the study of annual reports of the top market players and interviews with key opinion leaders, such as CEOs, directors, and marketing personnel. The figure below shows the breakdown of primaries, on the basis of company type, designation, and region, contacted during the research study. As of 2017, Toyota Industries (Japan), Jungheinrich (Germany), KION (Germany), Daifuku (Japan), and Hyster-Yale Materials Handling (US) were the major players in the AMH equipment market. Other players in the AMH equipment market include Hanwha (South Korea), John Bean Technologies (US), KUKA (Germany), BEUMER (Germany), Fives (France), KNAPP (Germany), Murata Machinery (Japan), SSI Schaefer (Germany), TGW (Austria), and Viastore (Germany). How do the AMH equipment manufacturers position themselves in this competitive market? Which are the major industries maximally adopting AMH equipment? What are the growth perspectives of the market players in different regions? In this report, the overall AMH equipment market has been segmented on the basis of product, system type, function, industry, and geography. Automated material handling (AMH) equipment helps manufacturing and warehouse operating companies to efficiently manage their material handling operations with minimum risk to personnel and increased savings. The AMH equipment market is estimated to be valued at USD 33.46 billion by 2018 and is expected to reach USD 53.59 billion by 2024 at a CAGR of 8.2%. The growth of the market is fueled by the growing presence of start-up companies offering robotic solutions for warehouse automation, increasing popularity of AMH equipment among leading industries, significant recovery in global manufacturing, and rising labor cost and safety concerns. The AMH equipment market for robots is estimated to hold a large share during the forecast period. The use of robots can reduce labor cost, protect personnel or employees from injuries, and provide a high return on investment. Such advantages are fueling the demand for robots in manufacturing units and warehousing facilities. The unit load material handling systems is estimated to lead the market based on system type during the forecast period. The wide use of unit load material handling systems in various industries is attributed to their cost-effectiveness and ability to handle several items simultaneously, thereby reducing the number of trips, time required for loading and unloading, and cost of handling. Storage function is projected to lead the AMH equipment market during the forecast period. The benefits of using AMH equipment for storage include warehouse floor space utilization, increased storage speed, efficient handling of heavy items, and reduced frequency of workplace accidents. These benefits are driving the growth of AMH equipment market for the storage function. The automotive industry is estimated to lead the overall AMH equipment market during 2018–2024. Key factors such as the needs for constant availability of components and spare parts, just-in-time (JIT) delivery of materials, and reduction in the cost of unproductive labor are driving the growth of the market for this industry. APAC is expected to account for the largest share of the AMH equipment market by 2018. The rising awareness related to material handling automation, increased emphasis of leading economies such as China and Japan on robotics and automation, and growing e-commerce industry are some of the primary factors contributing to the largest size of APAC in the market. China has been the main contributor to the growth of AMH equipment market in APAC. The improving manufacturing and warehousing infrastructure in China is projected to boost the AMH equipment market in this country in the coming years. The players in the automotive industry seek improvement in manufacturing through automated, efficient, and effective processes. These companies need to carry out their manufacturing and assembling operations efficiently by handling a wide variety of components carefully and keeping track of the same. The deployment of AMH equipment in this industry prevents damage to auto parts, reduce the cost of unproductive labor hours by handling inventory, and maximize storage capacity within the available floor space. The companies use AMH equipment, such as AGV, ASRS, automated conveyors, cranes, and robots, to fulfill these requirements. Metals and heavy machinery is one of the industries which involve repetitive handling and transportation of large and heavy components or assembly parts. The manual handling of heavy metal sheets and machinery can cause injuries to workers and potentially damage the product. This leads the plant operators to increase the efficiency of operations for ensuring smooth movement of heavy equipment within the manufacturing and warehousing facilities. Thus, handling these bulk items as well as moving them to manufacturing or production areas requires AMH equipment. The food & beverages industry has undergone a significant evolution in the past few years. The growing trend of consuming processed food and packaged eatables is driving the need for advanced manufacturing and warehousing solutions for the manufacturers. In the food & beverages industry, the time-to-market of finished products is very less due to their perishability. Consumers buy groceries and food items several times a week, which makes the inventory turnover of food & beverages warehouses faster than the warehouses in other industries. Moreover, the food & beverages companies need to comply with the food service guidelines set by local and state health departments, which specify the hygiene, storage, and efficient handling of food items. The hygienic handling of food is of utmost importance in the food & beverages industry. Food & beverages manufacturers and distributors require effective logistics solutions to manage their operations efficiently and sustain their business by offering fresh, healthy, and safe products. Therefore, installing AMH equipment in the food & beverages plants helps standardize food processes along with reducing wastage and labor costs as well as enhancing safety. The routine operations in the companies in the chemicals industry involve working with various dangerous chemical substances. Therefore the workers in the chemical plants are subject to extremely harmful environments due to proximity with the volatile raw materials; this affects their work efficiency and eventually leads to failure in maintaining the maximum efficiency of production. Therefore, the companies need to carefully assess the storage area and handling practices to avoid accidents. The chemical manufacturing companies are deploying AMH equipment to perform and manage their work more effectively. With the implementation of AMH equipment, companies can keep their employees safe from harmful raw materials, and improve the productivity and efficiency of their warehousing operations. The high upfront cost of AMH equipment for SMEs and excessive integration and switching costs are restraining the growth of the AMH equipment market. As of 2017, Daifuku (Japan), Hyster-Yale Material Handling (US), Jungheinrich (Germany), KION (Germany), and Toyota Industries (Japan) were the major players in the AMH equipment market. These players are focusing on product launches; acquisitions, expansions, and contracts; partnerships; agreements; and collaborations to expand their product offerings and businesses. 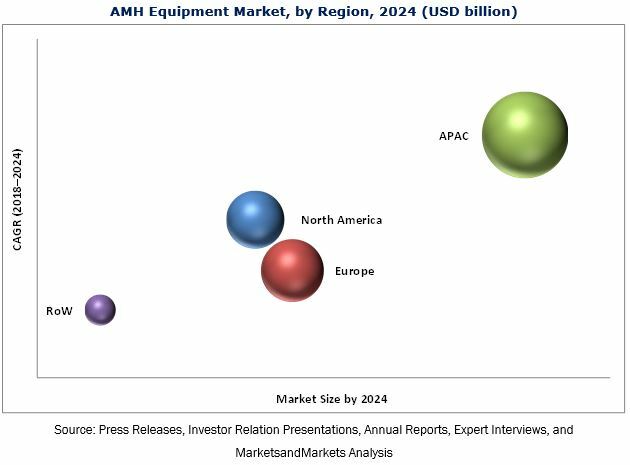 Other players in the AMH equipment market include Hanwha (South Korea), John Bean Technologies (US), KUKA (Germany), BEUMER (Germany), Fives (France), KNAPP (Germany), Murata Machinery (Japan), SSI Schaefer (Germany), TGW (Austria), and Viastore (Germany). Which type of AMH equipment is expected to have the highest demand in the future? For which type of function the AMH equipment is adopted the most? How does AMH equipment facilitate various functions of manufacturing and warehousing facilities?